This engaging war story, told from the perspective of a destroyer's executive officer (XO) and later captain, depicts the constant dangers faced by American destroyers at radar picket stations during the Battle of Okinawa as they tried to prevent Japanese aircraft, including many kamikazes, from reaching larger American ships such as aircraft carriers and troop transports near Okinawa. Captain Pudge Tallmadge, Executive Officer Connie Miles, and rest of the crew of the fictional destroyer Malloy work together to survive a constant onslaught of kamikaze attacks, more frequent, intense, and destructive than those in real history. The novel presents the fighting completely from the American side of the battle as Malloy's officers and crewmen observe the effectiveness of kamikaze attacks and develop tactics to lessen the chances of being struck and to minimize losses if hit by one or several kamikaze aircraft. P. T. Deutermann attended the Naval Academy and served in the Navy for 26 years including on destroyers, which explains the realistic, although at times technical, language used in this novel. He has written almost 20 books concentrating on thrillers and sea stories including the WWII novels Pacific Glory (2011), Ghosts of Bungo Suido (2013), and The Commodore (2016). His father, Vice Admiral H. T. Deutermann, served in 1945 as a division commander (commodore) of destroyers at Okinawa, although he spoke nothing to his family about his experience there because as his son explains (p. 277), "It was simply that bad." Although this novel does not focus much on relationships between characters as it mostly concentrates on suspense of impending kamikaze attacks and fighting during battles, the author does effectively present the emotions felt by Connie Miles, who transfers to the destroyer Malloy after having served as gunnery officer aboard the aircraft carrier Franklin. He has to handle the delicate predicament where the respected captain loses his nerve in battle and cannot handle his leadership position. He must face uncertainties as a new XO, then as temporary commander when Captain Tallmadge gets relieved of duty, and finally as permanent commander who has to lead his crew against kamikazes at the most dangerous radar picket station just to the north of Okinawa where many Japanese aircraft pass on their way to try to reach the main American fleet. He also has to handle sensitively the communication to the family of Commodore Van Arnhem, who dies aboard Malloy when hit by friendly fire during battle. Deutermann explains that this book portrays fictional events and that all of the characters and events are "either products of the author's imagination or are used fictitiously." He states that he has taken some liberties with the historical sequence of events and that for the most part has fairly accurately described the horror of the radar picket line. Still, in many places he exaggerates the effectiveness of Japanese kamikaze attacks during the Battle of Okinawa. For example, in the novel, the destroyer U.S.S. Littell gets struck by two kamikaze planes, sinks after breaking in half, and loses all but 22 out of 300+ crewmen. Also, the destroyer Westfall gets struck by a column of four kamikaze planes, and rescuers recover only about 60 or 70 men from the total crew of 330. No destroyer sunk during the Battle of Okinawa had so many deaths as Littell and Westfall. The destroyers Drexler (DD-741), Morrison (DD-560), and Luce (DD-522) lost the most men in a kamikaze attack during the Battle of Okinawa. They lost 158, 155, and 149 men, respectively, with each having a little more than 300 men on board prior to the attack . The novel includes some other overstatements of Japanese kamikaze effectiveness in comparison to historical results. Two Betty bombers sink the destroyer Daniels when they hit her in a vertical dive from 8,000 feet that cut her in half. In the Battle of Okinawa, no Betty bombers, probably due to their slowness, made suicide attacks on American ships, although they did carry ohka rocket-powered gliders into battle to release them to make kamikaze attacks. Malloy's officers mention that a "controller" snooper plane, which stayed out of gunfire range but could see the battle action, directed the actions of incoming kamikaze aircraft, but this seems to be one of the products of the author's imagination that did not exist in history. Witnessing the effectiveness of four kamikaze planes in "line formation attack" that sank the destroyer Westfall, Captain Miles becomes concerned and strategizes with his officers on the best defense to protect the ship and her crewmen in the event of such an attack formation. However, the Japanese military in actual history never used with any effectiveness this type of line formation aerial attack. In the novel, the aircraft carrier Franklin lost 800 men in a kamikaze bombing attack, but actually Franklin got hit by bombs dropped from a conventional bomber. Combat Air Patrol (CAP) in the novel rarely gives assistance for Malloy, although CAP often provided support to destroyers at radar picket stations during the actual Battle of Okinawa. The story emphasizes a single destroyer at most radar picket stations, but actually two destroyers usually were at most picket stations. Captain Miles and Malloy's crewmen hear about and witness numerous kamikaze attacks, so they know what most likely will happen when they are assigned to a radar picket station that has experienced many kamikaze attacks. After seeing the destroyer Westfall sink quickly when hit near the waterline by four kamikazes in a line formation, they develop a radical defense plan to counter a line formation attack by having men not on the guns to drop down below deck and by pointing the ship's stern towards where the kamikazes approach the ship in a line. When six kamikaze planes approach in a line formation, Malloy gets hit by four of them, but the ship survives with nobody killed and only 13 men wounded because of the effective defense. 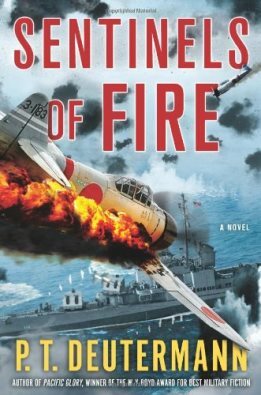 Readers of this exciting novel will really get a sense of the fear and horror that destroyer crewmen on the radar picket line during the Battle of Okinawa must have felt as they faced incoming kamikaze planes. 1. Rielly 2010, 321-4. Rielly states 159 men died in the attack on Morrison. The number of 155 dead used in this book review comes from an official US Navy listing of men killed in the kamikaze attack that Morrison survivor Bill Schurmeier obtained in the late 1980s when trying to get information on former Morrison crewmen (refer to Note 5 on 2007 USS Morrison (DD-560) Reunion).